Welcome to a multi-sector network convened periodically by a retired federal employee who is based in Colorado Springs. 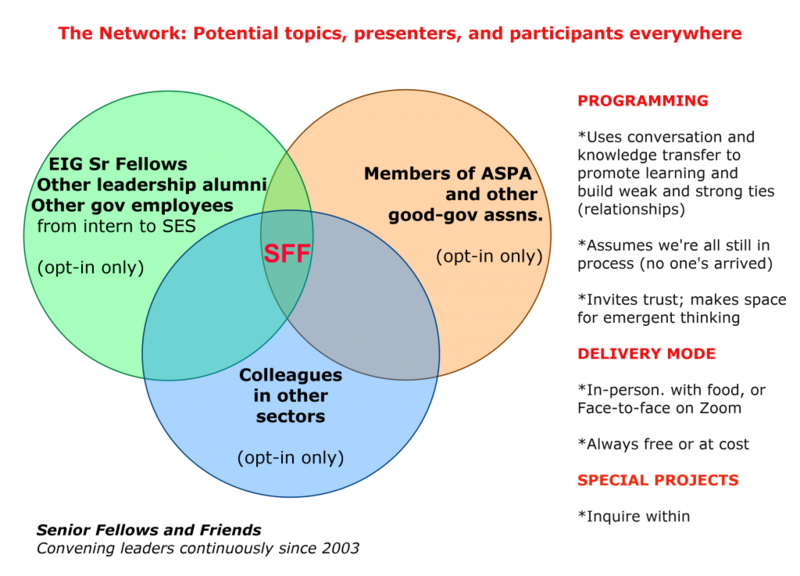 “Senior Fellows” are graduates of the Excellence in Government Fellows Program who have opted in. “Friends” are equally valued others who participate in constructive conversation and experimental activity that fosters agility and transfers knowledge to help colleagues and improve organizations for the good of all. These events are produced at cost so that they’re also affordable for those who are living on less. I do not subscribe to the notion that “you get what you pay for.” Rather, likeminded colleagues and I think that there is immediate and continuing value in showing up with everything you’ve got when you think an event looks promising. Newsletter signup will be added to the site soon.